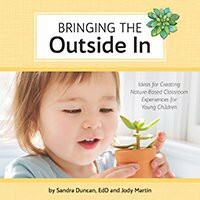 Bringing the Outside In: Ideas for Creating Nature-Based Classroom Experiences for Young Children offers extraordinary nature-based experiences to encourage educators and young children to bring the natural world into the early childhood classroom. Each hands-on, open-ended, and sensory oriented experience is designed to spark discovery and imagination; encourage conversations and collaborations; allow young children to develop a sense of wonder and get to know the natural world inch-by-inch and bit-by-bit; and preserve the joys of childhood. Bringing the wonders of nature to children is truly a worthwhile journey. The Nature-based experiences in this book are arranged in 4 chapters: Exploring: Develop a deepening care and connection with the natural world as children interact, question, investigate, test, define, and refine their ideas. Creating: Help children begin to understand the beauty of nature and become familiar with its textures, patterns, and colors. Thinking: Create exhilarating thinking and understanding experiences for young children to learn. Sprouting: Learn about ways to bring the wondrous outside world of seeds, plants, and gardens into your classroom.